In our 5th year at Gedong Gandhi Ashram, Candidasa, we’re offering eight retreats with more dates/ yoga choices, plus idyllic Ashram’s ambience to make each a ‘treat’. We are blessed with an exquisite mix of international & local yoga teachers who bring divine yoga to it’s natural home – a ‘living and breathing’ Ashram. Join our routine puja with our live-in members. The new Ashtanga Hatha Immersion extends our Hatha Retreats and should resonate well with the serious yoga aficionados. Still unbeatable value with all meals/most services included, hence our many returning yogis! Our ‘sankalpa’: A yoga filled retreat that gently blends with our unique Ashram ambience, with visiting and Ashram’s in-house yoga teachers. Modest yet comfortable seafront or seaview bungalows, full-meal accommodation with our wholesome, vegetarian and fish meals. Good value & affordable – with a touch of community service (your stay there alone helps finance its operations). Access to ashram’s facilities and services. Or to simply interact with ashram members or join the puja/prayers; observe/learn Ashram’s cooking; retreat to our meditation room; or swim in the open sea. The Ashram is idyllically located in the auspicious confluence of ocean and a spring-fed lake with a sacred temple nestled on the slope of the overlooking hill. Nyepi (31 Mar 2014): Yoga and the Ashram provide the perfect backdrop to Bali’s New Year’s Day of Silence which revolves around reflections, refrain from earthly desires/work or man-made disturbances, and to engage in spiritual readings/pursuits. Hence, total ban on lights, fire, cars and, indeed, airline flights – a unique experience to live to the spirit of Nyepi (from sepi/quiet). This auspicious day will be incorporated in our 29 Mar to 5 April Hatha Retreat. Day1 check-in, Ashram progs; Day 2- 6 Retreat Progs; Day7 Morn prog/lunch, 2 pm check-out. Primarily Hatha Yoga with a blend of daily sun salutation, asana, vinyasa, pranayama, nidra as well as delving into the philosophical and spiritual context. The classes cater the full range of yoga proficiencies, as our experienced teachers tune in to the class and the individuals. Program Format below should give an idea, and more about the teachers background/style can be gleaned from their individual links at the end of this document. One afternoon/night temple puja group tour with members is included but consensus will prevail as it may impact on some yoga time. Same goes with additional tours at extra costs; these tours are available pre or post retreat for those with additional days/stay at the Ashram. Costs AUD 450 twin-share; AUD 100 non-share surcharge; (if avail) AUD 500 non-share Kelapa Mas. An immersion into ashtanga hatha yoga for beginners, for the curious and also for the ashtanga practitioners who wish to explore and deepen their self practice. 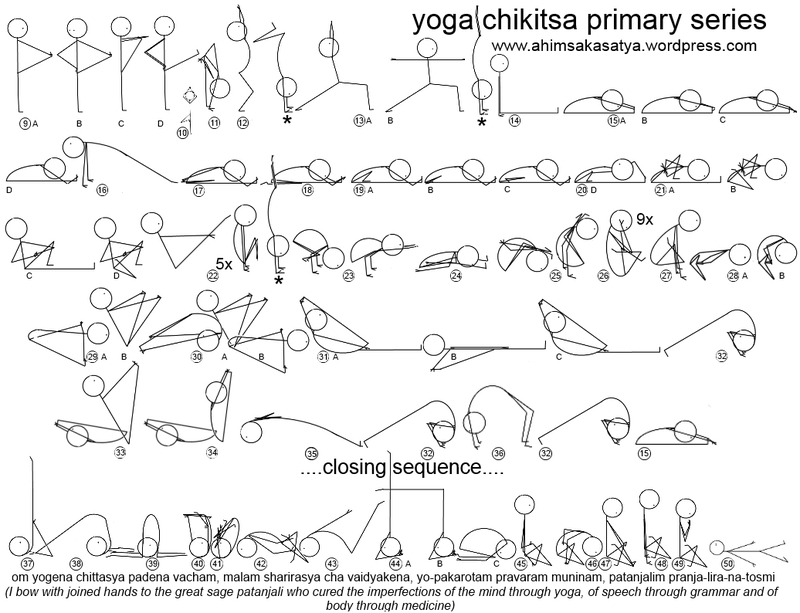 Inspired by, but not limited to, the ashtanga vinyassa sequence of Sri Patthabi Jois. Focus of these 3 days is to establish or finetune your own practice based on the ashtanga primary sequence. Depending on where you are with your body and mind the sequence can be modified, adding or skipping asana’s (or vinyassa’s), and yin-yoga for ashtangi’s (weaving the limbs of the 8 astau/limbs of the yoga practice into the physical asana practice). There will be self practice classes (working on your own pace and asana’s, the so called mysore style) and classes practicing together with the group (Led classes). The special classes are to help you further in your practice, supply you with additional information and asana’s, and a better understanding of the ashtanga yoga, and going beyond the merely physical aspect. The ashtanga practice is definitely a more strenuous and intensive practice, as it is meant to be a purifying practice. However, the first guideline is always to work within the limits of your own body. Learning to listen to your own body (and breath). From there we explore these limits, taking them as frontiers rather than limitations, and going beyond the set expectations you have of your body and mind.